Reflection Media, a small web-design and development firm with a focus on WordPress Custom Solutions, was hired to implement the design and structure of the portal. They answered a few questions about Animal Politico and WordPress. Animal Politico is a Mexican political portal. It’s only available online and is powered almost entirely by WordPress.Since its launch last Autumn, there are over 5000 articles and 44 sub-blogs out of which 3 sub-blogs are used as sort of a discussion forum. Custom profile fields for users like date of birth, education level, etc. MailChimp integration – sending newsletters directly from the WP admin panel. What publishing challenges did WordPress help Animal Politico address? I think what was most needed by the editors was flexibility to post, sort and prioritize news articles. With the help of custom taxonomies and a few custom meta-boxes we were able to offer them just that without any problems. Price was also an issue and choosing WordPress as our platform considerably reduced the development expenses. What are your (development) team’s favorite WordPress features? I think the flexibility we get from the hooks and filters system is what we love most. It provides almost unlimited flexibility without disrupting the update path. Every now and then I like to remind people about upcoming WordCamps. WordCamps are locally-organized, casual conferences held all over the world that focus on WordPress. Bloggers, developers, and every other kind of WordPress fan get together to show off cool things they’ve done with WordPress, teach and learn from each other, meet new co-conspirators, and generally have a crazy fun day or weekend with other people who share their love of WordPress. Often, members of the WordPress.com team from Automattic are in attendance, and would love to meet more of you! There are WordCamps this weekend inAlbuquerqueandPortland, so if you're anywhere near these cities, you should try to attend (we’ll be there!). In Portland, theWordPress Foundationalso will be sponsoring some special activities aroundSoftware Freedom Day(I’ll be at this one, testing and giving a sneak peek to attendees of some new features in the works). Is there a WordCamp coming up near you? Let's find out! There are also a number of WordCamps still in the early organizing stage that do not yet have dates set. These include: Ft. Wayne, IN;London, UK;Edmonton, Canada;Baku, Azerbaijan;Oslo, Norway;Sacramento, CA; Birmingham, Alabama;Pittsburgh, PA;Omaha, NE;Orlando, FL;Tokyo, Japan;Paris, France;Zagreb, Croatia;Nashville, TN,Washington DC,Baltimore, MD;Bangkok, Thailand;Istanbul, Turkey. Hope to see you soon at a WordCamp near you! Whether you're a WordPress.com veteran or blogging newbie, the updated version of Learn WordPress.com is sure to teach you something that you don't already know. We've also added a section called 10 Super Awesome Insider Tips. It contains pointers on how to use some of our coolest (but easily overlooked) features like Distraction Free Writing, which expands the text editor and hides the modules on the publishing screen, to help you stay focused while you create content. So have a look and tell us what you learned! And if there's anything you want to know more about, be sure to let us know. Earlier this week we released a new shortcode on WordPress.com to help you embed Wufoo forms in your WordPress.com posts, pages and even sidebars. Our friends over at Wufoo wrote about it on their blog and we wanted to let you know here as well. On their end, Wufoo integrates with other services as well. For example, a you could build a newsletter signup form, which sends those signups to MailChimp, all starting from your WordPress.com blog. If you or your company is a 37signals fan, you can send your Wufoo form results to Highrise or Basecamp. Wufoo is a paid service and also offers a free plan that you can use for as long as you like to see if the service works for you. For more details on embedding Wufoo forms on your WordPress.com blogs, check out our new Wufoo support page. We’d like to thank Chris Coyier over at Wufoo for helping us with the shortcode. 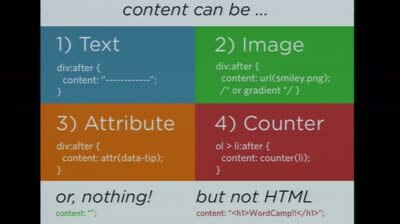 Also, if you’re using the Custom Design upgrade on WordPress.com, you might be interested in Chris’ great talk from WordCamp San Francisco (embedded below) on some creative uses of CSS, and his site on the same topic, CSS Tricks. Saturday, September 17 is Software Freedom Day. To that end, a few announcements about this weekend’s hackathon and WordCamp Portland. WordPress 3.3 is about to hit feature freeze. This means it’s the last chance to squeeze in features that haven’t quite been finished, and enhancements and fixes that no one has had time to address yet. Around this time, there are often dozens of tickets that have patches, but the patches have not been tested enough to be committed to core. Then the contributors who worked hard on the patches are disappointed that their code doesn’t make it into the current release. You can help us prevent this! This weekend, we’ll be running a has-patch needs-testing marathon for the 3.3 milestone. Basically, we’re looking for people who can help test patches and/or refresh patches that need updating. Lead developers and core contributors will be hanging around in the #wordpress-dev channel on irc.freenode.net to answer questions as needed, and will be committing patches as they get enough verification. As you test the patches, report your findings on the trac tickets in question. If all developers who make a living working with WordPress helped out for even an hour or two this weekend, we could clear the 200 tickets or so that are in this situation. To make it fun, why not get together with other WordPress devs and have an in-person hackathon meetup? Hacker Room. There will be room set aside for people to work on core bugs and features slated for the 3.3 release. Hopefully PDX developers will hang out in here some of the time helping with the marathon. Welcome Free Software Projects! Normally WordCamps are 100% focused on WordPress, but in light of Software Freedom Day, the WC PDX organizers, in conjunction with the WordPress Foundation, would like to extend an invitation to all free software projects to participate in WordCamp Portland. There are a couple of rooms set aside that can be used for unconference sessions and/or hacker rooms for other projects. It would be great to have local representatives from a bunch of projects there — almost a micro version of OS Bridge or OSCON — to maximize the free software love and cross-pollinate ideas. Developers from other projects are also welcome in the WP hackathon room if they’d like to pitch in. Saturday will also feature the Software Freedom Day Happy Hour at the end of sessions. For more information or to get your project involved, contact the event organizers via the WordCamp Portland websiteor email support at wordcamp dot org. Usability Testing of 3.3 Alpha. As mentioned, we’re about to hit freeze, so we’ll be giving WordCamp Portland attendees a sneak peek at 3.3, seeing how they adjust to the new features, and getting feedback to help us with our last round of fixes before we get to Beta. There will be a signup sheet to participate. So, if you live it the Portland/Seattle area and haven’t already bought a ticket to attend WordCamp Portland, hurry up, as it’s going to be a great celebration of Software Freedom Day and WordPress. Nishita is a simple, minimally-styled photoblogging theme―now available for WordPress.com blogs. With a choice of dark or light color scheme, the muted design puts all the focus on your photos. Not only is this theme designed for photos, it loves big photos: the default layout is super-wide at 1024 pixels. Nishita example, dark color scheme. Theme options include two layout choices: “Photoblog” at 1024 pixels wide, or “Blog” at 768 pixels wide. For an even more reduced photoblog look, you could change your WordPress.com reading settings to show one post per page, and thus only one image will show at a time on your front page. This photo-loving theme also uses post thumbnails to show a small version of images on your archive pages. Personalize it with a custom background, header image, and menu. Learn more about this Nishita―and how to set it up for maximum photoblog awesomeness―over on the Theme Showcase. This theme is based on the original design by Brajeshwar.